Favourites Egypt successfully retained their title in the WSF Women’s World Junior Team Squash Championship inBoston – but hosts USA, celebrating their first appearance in the climax, forced the tie into a decider after former world individual champion Amanda Sobhy defeated the newly-crowned champion Nour El Tayeb on the final day of the World Squash Federation event at the Murr Center at Harvard University. Defending champions Egypt made a great start to the final as Nouran El Torky beat a nervous Sabrina Sobhy 11-9, 11-3, 11-3. Then came the match that was expected to bring the earlier individual championship to a conclusion – between 2010 champion Amanda Sobhy and her predicted successor Nour El Tayeb. Sobhy, determined to make amends for her shock semi-final exit in the individual event, edged a tight first, pulling away from eight-all. El Tayeb drew level – but New Yorker Sobhy ran away with the third to retake the lead. Holding a slight lead throughout the fourth, Sobhy eventually clinched her third match-ball to win 11-9, 6-11, 11-6, 11-9 to force the tie into a decider. “Amanda played so well, she hit the ball very hard and made no mistakes,” El Tayeb told the official sitewww.worldsquash.org/worldjuniors2011 afterwards. 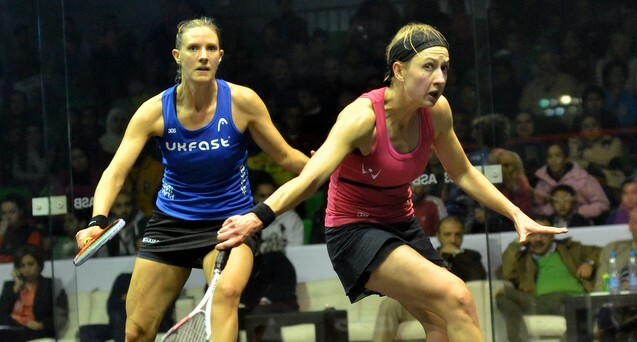 “It was in my mind that in 2009 she’d beaten Nour (El Sherbini) in the team event and today she beat me. But less than half an hour later, Egypt made sure of the title when Nour El Sherbini, winner of the 2009 title and runner-up in the 2011 championship, beat Olivia Blatchford 11-8, 11-3, 11-8. “When Nour lost I was quite nervous, I knew it was all on me now, but once I managed to take the first game I though everything’s alright now,” explained El Sherbini. Egypt coach Amir Wagih added: “It was a great team victory and a very special one. They’ve been working hard in the camps all summer and this is a great reward for them. “The team event is always tougher than the individual, all the other countries are determined and trying to push you, and all our players played right to the end of the individuals so there wasn’t much time for rest. “I promised we would try to bring the trophy back home and they did it, I’m so proud of them. In the bronze medal play-off for third place, sixth seeds Hong Kong China beat India, the third seeds, 2/1 – and former champions England improved on their finish two years ago by beating fifth seeds Malaysia 2/0 in the play-off for fifth place. And although New Zealand beat Wales 2/0 in the seventh place play-off, the eighth place finish was the best by Wales since their appearance in the inaugural championship in 1985. In the battle for 15th place between championship debutants Guyana and Ecuador, it was Guyana that emerged triumphant 2/0.